1 Dome at the top with a Drawer and a Slider Tray in front. Aarsun Woods bring to you the handmade puja temple made up of premium quality wood and beautifully crafted by our skilled artisans. The temple is mounted on circular piers at the base and above the base there is single drawer for puja essentials like rosewater,matchsticks,incense sticks etc. Above that there is main place for deity called “GARBAGRIHA”in a closed set.There are two pillars carved at the front of the temple and beautiful carving done over at the doors of the temple. At the top of the roof there is a single dome placed with beautiful mehraab design at the front. 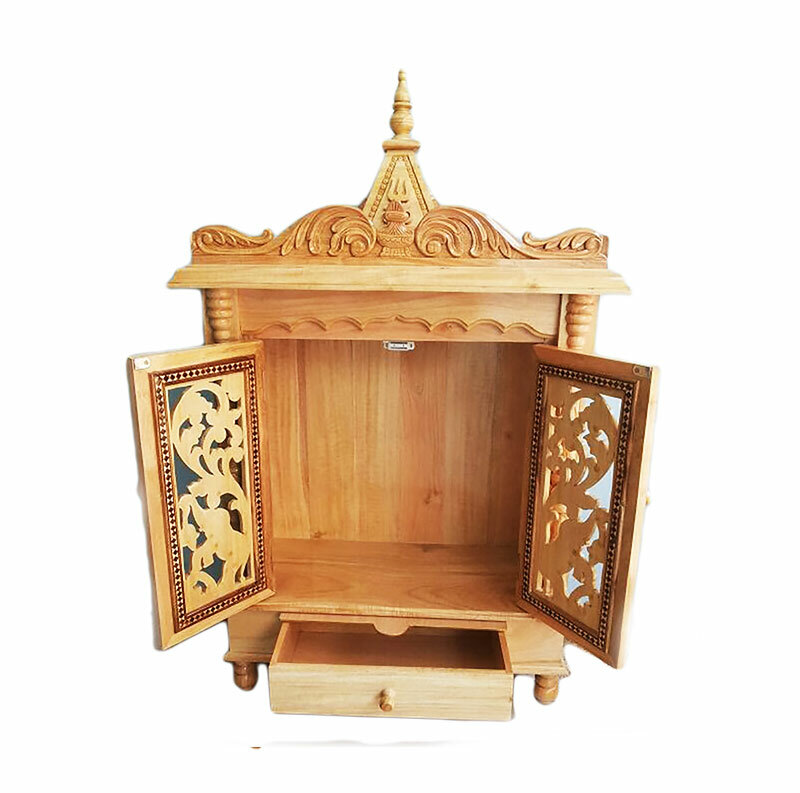 The temple is best suitable for home and office purpose.As we are the manufacturers so customization’s are available as per customers requirement.We provide free shipping across India. Teak wood has a very attractive looking straight grain pattern coupled with a rich golden-brown color. In addition to this teak wood furniture also feels great to the touch, when compared with the newer engineered wood alternatives such as Particle boards, MDF and even plywood. Note: This unit takes about 15-20 business days to be manufactured.